The protein complex formed by the Ca2+ sensor NCS-1 and the Guanyl Exchange Factor Ric8a co-regulates synapse number and probability of neurotransmitter release, emerging as a potential therapeutic target for diseases affecting synapses such as Fragile X syndrome (FXS), the most common heritable autism disorder. Using crystallographic data and the virtual screening of a chemical library, we identified a set of heterocyclic small molecules as potential inhibitors of the NCS-1/Ric8a interaction. The aminophenothiazine FD44 prevents the formation of the NCS-1/Ric8a complex, it reduces the aberrant excess of synapse number to normal levels and improves associative learning in a Drosophila FXS model. The high-resolution crystal structure of NCS-1 bound to FD44 and the structure-function studies performed with structurally close but inactive analogues explain the FD44 specificity and the mechanism of inhibition. We found that FD44 is an allosteric inhibitor that stabilizes NCS-1 in a conformation that is incompatible with Ric8a binding, which explains how a small molecule can inhibit such a big and complex protein-protein interaction surface. 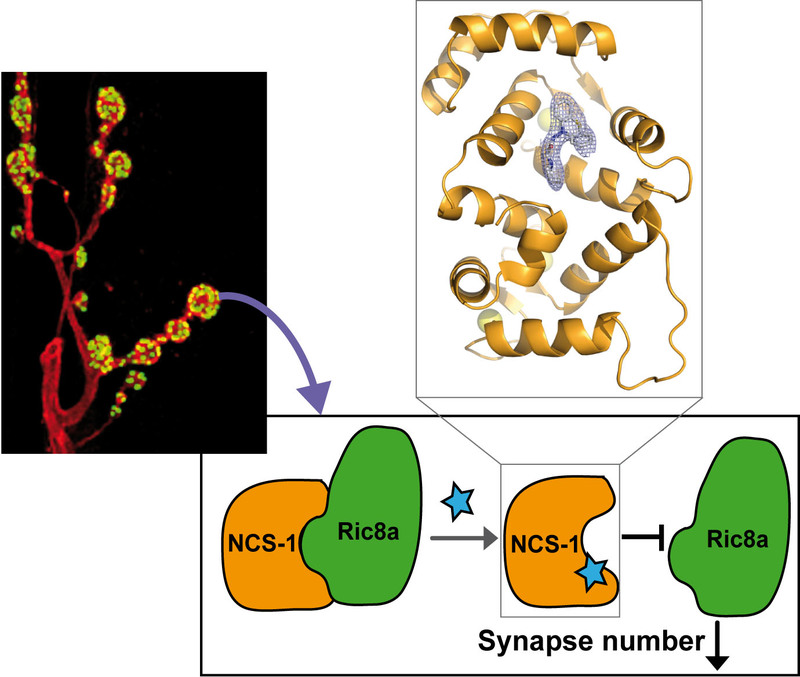 Our study demonstrates the druggability of the NCS-1/Ric8a interface and uncovers a suitable region in NCS-1 to develop additional drugs for the treatment of FXS and related synaptic disorders. This research in this article was supported by an Instruct R&D award APPID99 to Maria Jose Sanchez Barrena (CSIC, Spain).